Hyderabad: Walk the streets of this south Indian city, and one acronym is hard to miss: Icfai, as in the Institute of Chartered Financial Analysts of India, shortened to Icfai Business School, or Icfai National College, or Icfai distance learning centres. Icfai, one of the pioneers in private higher education in India, has a landscape and reputation as varied as its locations. Its flagship school, the Icfai Business School, or IBS, in Hyderabad, inaugurated a campus last year just west of the city. Grass carpet courtyards give way to peach and glass buildings, and sidewalks are lined with coconut and mango trees. Overall, its competitive pool of students generally didn’t clear the Common Admission Test required for admission to the top Indian Institutes of Management, but came pretty close. “I passed most (exams) but saw 1,800 people here, and the scope of diversity, the huge chance of networking," says second year student Loveleen Sethi on his decision to study at Icfai. On the other end of the spectrum, perhaps, is the Jammu campus of Icfai National College, or INC. There, Vikrant Dogra, whose cousin was forced to leave the MBA programme after failing in graduation, is leading a campaign against what he terms the “unethical" treatment of “people from far-flung areas". 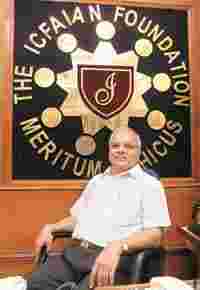 Icfai “is just running in three or four rooms in a banquet marriage hall," he says. Now, it quietly churns out more than 12,000 business school graduates each year, around 4,000 through its more high-profile IBS and 8,000 through its vast network of rural INCs. “They’re a classic example where the good is not the enemy of the great," says Manish Sabharwal, chairman of staffing firm TeamLease Services Pvt. Ltd who has worked with Icfai in the past. “They got (the) quantity right, and are now moving up the quality chain." The organization, led by N.J. Yasaswy, has weathered a few highly publicized scraps, with the US-based Chartered Financial Analyst Institute, over the right to use the CFA title, and with the government over the official status of private universities, an issue that went before the Supreme Court. More recently, Icfai schools have run into complaints by students over high fees, and refunds they felt entitled to. The INC chain has been accused of fostering cheating at some centres, using overly aggressive recruiters, and charging high fees without providing adequate training or placement, but INC’s registrar, K.S.N. Sukumaran, brushes off such talk as the cries of a vocal few, inevitable since the colleges teach 21,000 students each year. Icfai has emerged from such conflicts relatively unscathed, growing exponentially year after year. IBS started in 1995 with eight centres; now it runs 18 in India, and is planning to open seven more centres abroad next year. INC, which uses IBS curriculum but runs more spartan operations in rural areas, launched with seven schools in 2003 and is now up to 172 across the country. The distance learning programmes, which account for about a third of the organization’s revenue, roughly the same amount that INC and IBS also each bring in, offers more than 100 different courses. Icfai has also set up a handful of universities, in places such as Dehradun and Uttarakhand in the north, and Agartala and Tripura in the north-east, to not only grant its business degrees, but also to offer courses in everything from law to engineering. Last year, Icfai’s operations had a turnover of around Rs180 crore, this year that number increased more than twofold to close to Rs460 crore. The school’s reputation among recruiters and management education experts is mixed. Three IBS locations made it to the recent Mint C-fore business school rankings; the Hyderabad campus took the third slot among private colleges. Other popular rankings such as those compiled by Outlook magazine or the business school website Pagalguy.com, also put several Icfai schools among their top private colleges, albeit further down in the top 50. Many of India’s largest companies recruit from Icfai campuses, though often for less coveted positions. Wipro Technologies, the global IT services arm of Wipro Ltd, India’s the third biggest software exporter, gave 50 offers this year to IBS students spread over the Hyderabad, Gurgaon and Bangalore campuses, many of which were sales roles, according to Sagar Raina, a Delhi-based recruiting manager for Wipro. “The quality is decent, and these guys are good at sales positions," he says. In qualitative terms, Raina rated IBS students in this way: on the quality of students, he gave a seven out of 10, on presentability, a 6.5 out of 10, and on subject matter, a six out of 10. He says Wipro is also considering adding IBS Mumbai to its campus list for next year. Icfai’s considerable growth is built on a strategy of getting into each sector of management education. If a market or labour pool didn’t exist, the solution was to create one. Icfai has a research arm to develop its own case studies, and a publishing arm to print journals and magazines that give faculty an outlet for their work. When faculty proved difficult to recruit, Icfai set up more campuses to bring schools to the doorstep of possible instructors. Both IBS and INC have their own PhD programmes to train professors and fix their long-term teacher shortage, a problem affecting the elite IIMs as well as lesser-known schools. “Do you want to repeat what others are doing?" asks Yasaswy, explaining the thinking behind much of Icfai’s strategy, “Or do you want to try something else?" Icfai started in 1985, as the Institute of Chartered Financial Analysts of India, to offer distance education classes to financial analysts. A decade later, flush with funds that came in with the popular CFA course, Icfai launched its business school with eight centres including metros such as Delhi, Bangalore and Mumbai. The quantity-based strategy came into focus as plans for the business school came together. An IIM-alumnus board member assembled a project report that estimated one B-school would require $10 million (Rs48.4 crore) to start. “He arrived at that number because a B-school for him meant IIM; a big campus with a lot of hardware," Yasaswy says, “but we didn’t have that kind of money". So instead of looking at the best Indian institutions, they turned abroad, to the city-style campuses of many American business schools, for inspiration. Boston’s Suffolk University, Yasaswy says, for example, is “absolute downtown, and distributed on three or four buildings". Rather than start with its own land and build from the ground up, Icfai took out long-term leases on a handful of buildings, and spent most of its money developing course content and hiring faculty. “The demand for qualified managers was increasing tremendously and one school, slowly, wasn’t going to address it," he says. It’s a model that tends to makes sense in India. “(Yasaswy) doesn’t want to build a Harvard, a Wharton," Teamlease’s Sabharwal says, “but (Icfai schools) are absolutely better than what the government provides, and have a huge role to play." Relaxed on a holiday and wearing a pancha (traditional men’s garment in Andhra Pradesh) with a light blue checked shirt, Yasaswy speaks slowly and deliberately, with flashes of dry humor. Like much of India’s private education sector, Yasaswy rails against government regulation in his field, and criticizes outdated laws that hamper growth. “You need to invest Rs100 crore to start a good medical school with a teaching hospital," he says, “but you can only charge four lakh per student. (These kids are) spending more at (Cafe) Coffee Day than they pay to go to college." The organization is structured as a series of trusts, and Yasaswy says, Icfai regularly turns away investment bankers looking for an equity stake in the institute. Icfai’s plans for the next few years: six new international IBS centres to capture a portion of the market of the 150,000 Indian students who go abroad for a business degree every year; six more domestic IBS centres converted, like Hyderabad, to full residential campuses; Icfai universities in every Indian state; consolidate some of the INC centres, create campuses for others. But the driving goal is still to bring management education to the masses. “We are catering to people who have otherwise been denied seats for so many decades," says IBS registrar R.R. Reddy. In the latest round of admissions, IBS had 60,000 applicants for its 5,000 seats. “We don’t want to be selective, we prefer to be a school of access," says Yasaswy. “If 10 people are applying and only one is getting in, you should feel bad about it."